Welcome to Prairie Story Recipe Swap Thursday! I hope the Easter Bunny visits all of your homes this weekend! 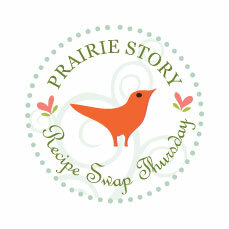 The most popular recipe from last week's Recipe Swap Thursday was Deviled Egg Dip @ From My Tiny Kitchen. This is brilliant! A perfect Easter appetizer! 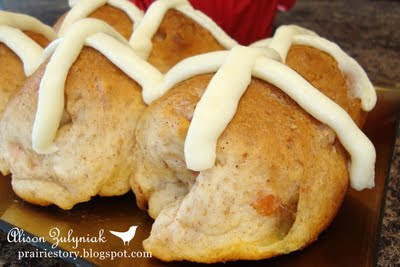 This week I'm sharing my Hot Cross Buns. It is said that sharing a hot cross bun with another is supposed to ensure friendship throughout the coming year, particularly if "Half for you and half for me, Between us two shall goodwill be" is said at the time. Those hot cross buns look fantastic. Great picture. Your recipe looks delicious! Thank you for hosting this blog party!